Check out the awesome lunches my dear sweet wife has been making us (this is Clay writing, by the way). Since we’re often with family or friends in the evening, we’ve enjoyed eating lunch together at home. Not only is Megan an incredible cook, but she has the ability to take little scraps, extras and left overs and turn it into an outstanding me al. 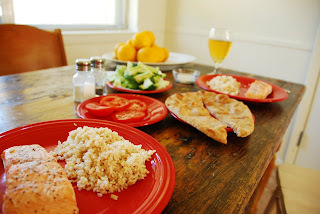 In this picture you'll see our nice spread of baked salmon, brown rice, wheat flatbread, broccoli and tomatoes. What a lunch! Lunches like this are usually eaten while watching, what else, an episode of MacGyver. We've been filling our days by spending time with friends and family, working on the Rosetta Stone, and taking care of little details that have to be done before we leave. I just got a new video camera and have been working with the settings and testing the footage, which has been great. I can't wait to get out there and start capturing some of the stories of what God is doing all around the world. As for when that will be, the last step is the visas. We're thinking they could come any day now. Until then, we'll be patiently awaiting God's timing. Can any day be bad that starts like this? I laughed really hard inside watching those two talking with the dog man. Every year the women on my mom’s side get together for a big reunion called the WWAC (why don’t you just drive yourselves crazy just guessing what that means ;). The last one was in July, but tonight felt wonderfully like one of those weekends. We had almost half our group, and laugh our heads off, we did! And of course we ate, too. Barbara made the best soup!! We celebrated Bill’s birthday- I am so glad we could be here for it! We then settled in to watch Mamma Mia, which was absolutely perfect. Orland and Bill were certainly troopers to watch it with us. I enjoyed snuggling with my cousin Kandice. Here’s our group shot, not the best one, but the one that makes me laugh. Right when we gathered to take the picture, this horrible show came on the TV with some kind of Indian ritual. I couldn’t draw my eyes away, even when Bill said “Cheese.” It was really sick, and I figured everyone was watching it and making the same faces, but now I am laughing really hard seeing that I was in fact the only sicko in the group. Nice, Megan. Goodnight to you! May you love and laugh with family! My mom and I decided to make a last minute trip to see my great aunties near Fort Worth. We are staying with Aunt Barbara and Uncle Orland and we are laughing ourselves crazy! Oh! I cannot even share the fun we are having- family is so wonderful. Here are Mom and Barbie getting ready to cook dinner. And here we are pj-ing it with our ice cream. I think this is when the hilarity truely hit. I haven't laughed so hard in long time. A sight that never gets old to me. I love walking down to my family's house across the pasture. Saturday was Dad's birthday so we walked down to Gma's house for a special lunch. I love meals at Grandma's. Over the years, our family has lost members and gained a few, but that dining room has fed us all. The weekend was summed up with a Pasche/Peltier/Sandoz Settlers tournament. We had been talking about it for weeks and finally made it happen. Happy Birthday Daddy! We love you so! My little loves came to town! On Friday the Meadows came to see us and it was soo wonderful! The big event of the day was making cookies with the kids, and we spent the rest of the day just HANGING OUT!! Perfect. Last weekend we visited Louisiana to see Clay's family. We started in Lafayette with Tracy's fam. Oh, the cousins are just so precious! We had fun just watching them. Ed made Phil a gumbo spoon like his for Christmas. Baby brother has got him a BIG spoon! I really enjoyed Ed's garden- I even plucked my first carrot! Look at this! Why do we not all have gardens when there are veggies this beautiful to be grown?! So, a good trip, though sad as we said goodbye probably for the last time before Belgium. I am so thankful to have gained this Louisiana family when I married Clay. They are so welcoming and fun- I love you guys!